← Solar panel is on the roof! Cleaning my Casita! Wiring the solar panel! One of my favorite things to do is tidy up my tiny home. I love the scent of fresh air! Next I stand in the door of my Casita and shake out the shaggy tan throw rug that lies on the bedroom end of my house. I put all clutter away now that I have a place for everything. I walk over to the campground trash bin and dump my trash. The crew gets a good “airing” also as they sit in their exercise pen soaking up the sunshine. Every time I step outside, Bridget watches me. Spike sniffs the air for a while and then takes a nap. Back inside the Casita, I pass a damp washcloth over the fiberglass surfaces. (I buy bundles of cheap washcloths at Walmart for cleaning). Next I go over the floor with a broom, sweeping everything right out the front door. Hey, I’m living in a camper. I get to do that! Lastly I set up my outdoor washing station. Since I’m using my fresh water tank, the campground spigot is free for filling up two dishpans. I keep the two dishpans and a dish drainer in the back of the Perfect Tow Vehicle. I grab the pans, fill with water, squirt a touch of dish soap, and I’m in business. Dry the dishes and put them away. Grab some surface cleaner in a spray bottle and touch up the shower area. Swish the toilet and spray glass cleaner on the mirror. Bring in the quilts and make the bed. If I’m really energetic, I wipe the floor with a wet washcloth. That’s it! I’ve got a clean house! Around one o’clock Bill and Kathy come by. Bill runs a wire from the solar panel down to the charge controller inside the PTV. Kathy hooks up the temperature sensor wire coming from the inside of the battery box. 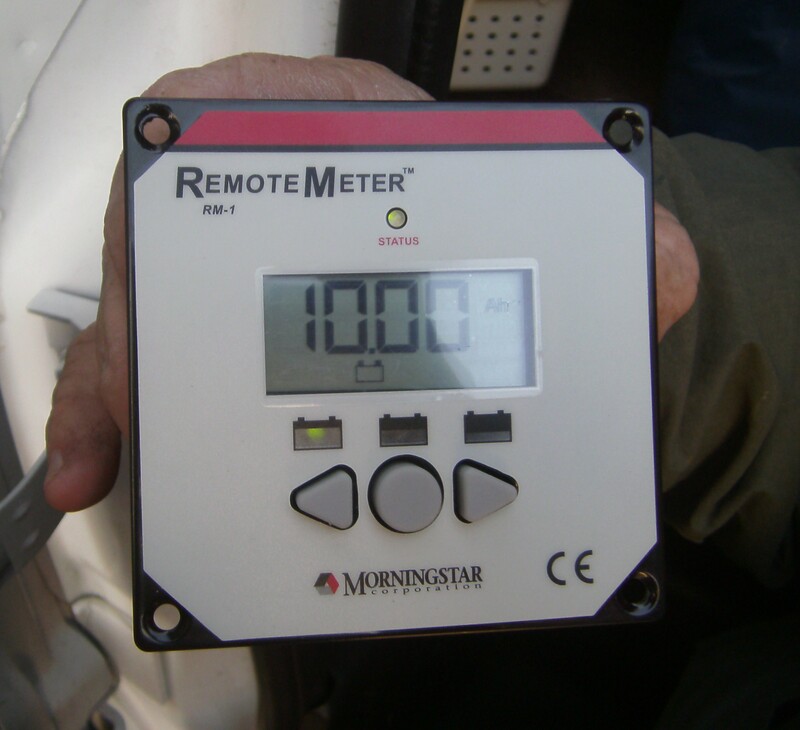 I can look at the remote meter and read the temperature outside the battery box and inside the battery box, as well as read volts, amps, load, level of charge . . . everything I might possibly want to know about my solar power! I apologize for not writing about the wiring of the solar panel which Bill finished today. It’s the kind of topic that requires illustration with photos. I’m having connectivity problems this evening. Rather than try to post all I want to say and show, and then lose it all to the cyber-gremlins, I’ll assume connections will be better tomorrow morning and then I’ll post photos of the solar wiring. This entry was posted in Simple living and tagged campground, casita, fulltiming, New Mexico, Percha Dam, remote meter, solar power. Bookmark the permalink. 0 Responses to Cleaning my Casita! Wiring the solar panel! Wish I could clean my house that fast…..I have way more junk than I need to have which makes cleaning sooo much more time consuming. I used to hate . .. absolutely HATE . . . to clean my four bedroom house. With my Casita it’s fun because it’s like playing in a dollhouse! And I know it’s not going to take forever. Sue, I loved your post! What a beautiful looking place. How big is the pen you have for your dogs? I’m thinking it would be a good idea for us to have one for our four bichons. Where did you find it? I consider the pen one of my most important possessions! I wrote about where I bought it and all the details in a blog entry in the middle of May, titled “Dog Exercise Pen.” Click on May in the archives . . . you’ll see it. Let me know if you don’t find all the info you need in that entry. The panels I bought are 30 inches high. I probably could have gotten by with the next shorter size, but a few extra inches is like insurance. You don’t need to spend more money for a gate panel because it’s easy to open a regular panel. Two sets of 8 panels would be just right for 4 bichons. I have 16 panels, so that’s what the photos show. Good you are getting all that cleaning done before the projected snow/rain/ice storms hit tomorrow afternoon/night. Am anxious to hear how life is with solar panel. Stay warm. The wind has picked up considerably (10 pm). It’s hard to believe the Casita may be christened with snow tomorrow! I know a 5th wheel that needs cleaning……………. Um, Chuck, you tried that when I washed the outside of the Casita and it didn’t work then either. Now that she’s clean, how about decorating for Christmas? A string of cheap multicolor Christmas lights from Dollar General works great. Last year I hung them INSIDE the Casita using drapery hooks in the carpet above the cabinets. Made a real Christmas-y ambience inside. Stay warm. The Weather Channel says “no significant accumulation” of snow and it’s supposed to be up to 51 there tomorrow so you should just have a chilly night. I’m so excited that you got your solar completed. Oh, boo. I wanted some snow! Wait till later! And there’s no guarantee that the Weather Channel is right. I love those cheap Walmart wash cloth bundles. They also sell some white bar towels that I find very useful. When they get too stained I don’t feel bad about disposing of them. I use the stained ones to wash and dry the outside of the Casita, section by section. Hi Sue, did you ever get your new faucet from Little House Customs? We went ahead and changed ours out, what a difference it makes! No, I haven’t gotten the high faucet yet. I wanted to order it but I didn’t know where I’d be or for how long, then I did stay put and then I forgot about it and then Thanksgiving . . . and so on . . .
As soon as I arrive at a place that I know I want to stay in for 5 days or so (and that has an agreeable post office), I’ll order it. That is a “must have” modification. my Mother used to call her cleaning method “A lick and a prayer!”. Many things remind me of her and fond memories, especially around the holidays. Let us know when you turn on your off-grid electrical system.